Barnes is a successful capitalist who believes capitalism in its present form is gravely flawed, yet he does not look to the state for correction. He sees the first phase of capitalism as one of shortages where demands exceeded supply of goods. Around 1950 this changed and now we are in capitalism 2.0, a time of excess goods and a shortage of buyers. This phase is characterized as being global in scale, abundant credit, ubiquitous advertising, and negative externalities (shifting trues costs to future generations or other countries for polluting, to take one example). He discusses the influence that capital has on the political process and cites three pathologies that come from what he calls "the anachronistic software that governs capitalism": destruction of nature, widening of inequality, and the "failure to promote happiness despite the pretense of doing so. " Changing capitalism to address these problems is a long term project (30 to 50 years). Central to this is the reality of the commons. The main danger to the commons is enclosure which benefits a few and takes from many. For instance, taking water from a river or lake and dumping pollutants after an industrial process. Barnes sees a need to expand the number of variety of commons that already exist--or could, given sufficient public will and legislative changes. Some of the common resources include those in nature (forests, the air, and water) but also the radio spectrum, aspects of culture and knowledge, an equitable health care system, the Internet, and social security. He devotes a large part of the book to explaining how these might work, their relation to corporations, and the need for birthrights for people in various commons. On a small scale the Alaska Permanent Fund is a good example of a variation on a land trust. Residents of the state get an annual payment from the payments into the state coffers by the oil companies drilling on Alaskan land. In 2006 the sum was $1106.96. I enjoyed the chapter on sharing culture because a theme of my work since 1990 has been the desire to digitize and spread all sorts of digital information and works. This is being carried on in different places, notably by the Internet Archive, collectives in Europe and Asia (some of whom believe intellectual property is an oxymoron), and various "open" projects supported by foundations like Hewlett, Sloan, and the Open Society Institute. The underlying infrastructure to store and move this information is based on the Internet, ever cheaper storage (hard drives, optical discs) and low cost access to these resources. The unlicensed public spectrum has become extremely popular in the countries where it is legal. Wi-fi is just one example of this spectrum commons. Just as I was reading the chapter on "Building the Commons Sector" I was wondering what Second Life would be like were it not a commercial enterprise run by a dot com. What if it were more like Burning Man where different rules apply to those participating. Barnes talks about his son playing Sim City and wonders what Sim Commons would be like. 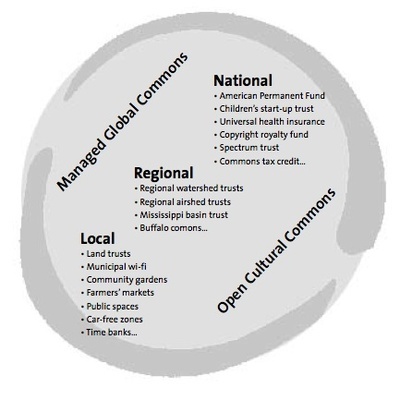 His diagram of the new commons sector included managed global commons, lists of national, regional, and local ones, as well as open cultural commons. His final chapter encourages each of us to get involved, and I think back to my own work from the late 80's to the mid-90's with electronic community networks which I called "electronic greenbelts" alluding to the no-build zones in urban areas that were, in effect, commons even though nobody was grazing sheep. These were not entirely successful, but they did pave the way for involvement in other projects for public access and the current wave of municipal and rural wireless networks being deployed. I hope this book is read and critiqued, especially by social activists who are critical of capitalism. I look forward to their reactions. Barnes and his publisher agreed to distribute a free version of this new title, yet they hope it will be a commercial success through the sales of the hardback version. Certainly, it is cheaper to download the pdf file, skim it on screen, but to read the whole version, most will prefer reading a printed format and not on a pda or mobile phone or even a large LCD screen. The care and feeding of a new device. I finally saw an XO computer. What was the occasion? Eben Moglen of the Free Software Foundation (FSF) spoke at Santa Clara University last night to an audience of forty five people from around the valley. It was sponsored by our center, the Markkula Center for Ethics, and the High Tech Law Institute. whose director Eric Goldman, organized much of the event and served on the panel that responded to Moglen's talk. I invited Matt Hamrick, cofounder of the Home Brew Mobile Phone Club, to speak as well. John Gilmore,a longtime FSF supporter, arrived during the talk, bearing one of the new green XO computers from the OLPC project. John is doing many, many projects and has paid for the development of Gnash, an open source embedded Flash player that will be in the XO. Gnash is a high priority project for Richard Stallman's FSF. Most of the software in the XO is "Free." The first thing I noticed was the lack of a crank to generate electricity. John said it had been removed from the original design because it was fragile and inefficient. Perhaps so, but energy alternatives for this device seem to be crucial if we look at the lack of electricity in many countries, even worse in schools and the living quarters of many of the students. We know that the XO draws little power, but the rate of recharge will be one factor that determines how much the user will have contact with the machine. Another will be school or ministry of education policy. I don't know if one laptop per child means each student will have access only in a couple of classes, the whole the school day, or will take it home in the evening and on weekends and vacations. I expect policies and access will vary greatly, depending on the culture, the environment, and the kids themselves.An older student is presumed to be more responsible than a six-year old. The problems with electricity will determine usage in many ways. If the student cannot generate his own electricity (DIY) for the XO then sources will be the national or city grid, a local generator running on fuel or perhaps solar power. A few places have their own small hydroelectric systems. In many schools there is no electricity. It remains a high cost part of the education infrastructure along with water and sanitation, the buildings, and telecommunications. 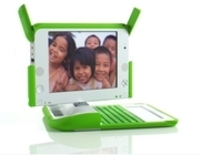 My experience has been in places like Uganda, Paraguay, and India where the lack of reliable power will greatly inhibit projects like OLPC. That said, perhaps the situation in the early adopter states like Libya, Uruguay, and Rwands know that most of their schools can recharge hundreds of these machines each day or evening, or that the students can do this at home while they sleep. The second issue is security. While there are different plans to disable an unauthorized device, what policies will be implemented to protect the computer from theft when the homes of those who may benefit most for having one are not secure, or in neighborhoods where the poverty already has led to petty or violent crime,where phone lines are stolen to resell the copper. All schools have security problems. Imagine the challenges of collecting, storing, and recharging hundreds of XO's each afternoon in a locked room and the redistribution in the morning. Whatever the solutions it is going to change daily routines for everyone involved, and what will happen if a child's machine is stolen from his home or from the school? Will the SD memory cards be secured separately? The World Bank is explaining the Millenneum Development Goals (MDG) in more ways that text or static pie charts. Mapping Worlds, a Dutch company, has designed dynamic maps that show statistics by country for eight goals including nutrition, education, poverty, equality for women, and environmental sustainability. For instance the poverty maps displays 'share of population living on less than $1 per day' and by animating it, the map resizes to one showing 'size of countries based on population living on $1 per day' so India, Nigeria, and a dozen other African nations balloon in size. What's cool you can rewind. However, as with all statistics you have to consider the reliability (some countries do not report or are not reliable) and while one dollar does not go very far anywhere, there is a big difference between living in Holland on $1 per day and with the same amount in Chad. Some people know first-hand just how bad the situation is in Iraq. Most of the world knows from news reports: print, electronic text, video clips, radio commentary. The BBC has some spectacular coverage including this article that makes very good use of an interactive map of the capital to show the location of the attacks but more importantly the shift in Sunni-Shia populations from 2006 to the present. Note that prior to 2006 much of the people lived in mixed neighborhoods. Now that is confined to the area in and around the highly protected green zone. What the maps do not show is how many people have fled the capital for other regions and for Jordan and Syria. I arrived at noon, in time to hear Mike Liebhold of the Institute For The Future present a somewhat hopeful look at the possibilities of the major mobile carriers opening up their systems to rapid innovation with a much lower entrance cost. He compared the vitality of the Web 2.0 applications and said that kind of user generation of content did not exist in the current networks. At lunch I spoke with Brian Topping of codehaus. He has been a web developer and is doing some work with mobile applications. He said there is a very informal way of getting help with development since there are not design and programming classes as there are with almost any topic in computer/Web development. He would find a programmer inside a company who would recommend the right tools to use and then be a sort of mentor, answering perhaps one question a week. Most phones can send geographic coordinates to some parties (the company, law enforcement, three letter agencies, and for a fee parents who want to track a child) but not to the owner of the phone. At a conference he asked a Sprint rep about this, and the guy said to ask Nextel (also owned by Sprint). Nextel had specifically negotiated that spec when they established their network with Motorola. There has been discussion about the way phone companies cripple existing phones and take OUT features that might work in Japan, for instance. GeoVector showed some slides and a movie of a pointing phone using their software to give information about an object when the user points the phone at a historic place, a restaurant and gets a review from a friend, or a group of places along the path she is walking along. It is working in Japan where they have mapped and described 700,000 objects on the KDDI network. One nice user interface was directions for walking in a city. Just follow a large arrow, not a verbal or cartographic reprentation of the destination. Several speakers could not be present, and others filled in including two students from NYU. Summer Bedard showed The Human Race where you called a number and were put on hold along with others. By answering questions (some humorous and some invasive) you decreased or increased the wait time. Botanicalls assigned plants phone numbers. Each plant had a sensor that measured moisture level, and when it dropped it activated a controller with small xb radios that talked to a computer and this called the owner who heard, "Hi, this is the ivy. I'm desperately in need of a drink. Could you water me?" After doing so, the plant would call again: "Thanks, that felt like a fresh spring rain." And you could call the plant and hear it describe itself. 212 202 8348. Mozes CEO Dorrian Porter showed the multiple ways SMS messages are being used around the world. One trillion were sent in 2006. He reported how the Finnish prime minister broke up with his partner using SMS: "It's over!" and the Finns have written a novel using SMS. In talking about developing countries 85% of the new phones are going there. Troops in the Congo have used SMS to coordinate attacks on villages. The British have used it to send messages to all their solders, and they are jamming some systems and blasting propaganda to hostile parties. He said that you can get a divorce by SMS in Malaysia, as long as it's final. Phil Zimmermann discussed his new project on VoIP encryption which is one of the proposals before the Internet Engineering Task Force to become a standard. Zfone is aimed at making communications safer, and he invoked all the bad things that could happen and are happening on the Net. He hopes the USG will use this eventually..
Again, thanks to the guys--Evan Henshaw-Plath and ?- who organized the Free-Tel sub-conference and to OReilly for allowing us into the main conference. The fast pace and informality were refreshing.